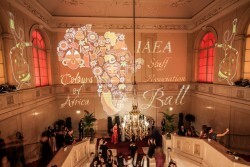 Recently, the IAEA Staff Association Ball 2018 took place in the halls of the Vienna Hofburg. Many international guests came together under the motto "Colors of Africa". A great multicultural ball with fantastic dancefloors from ballroom to latin to disco. A glittering and happy end to the 2018 ball season.